The Scappoose Indians, who have battled sickness and bugs all season, look relatively ready for their biggest swim meet so far this season. The boys and girls teams are headed to Parkrose High for their first Class 5A Northwest Oregon Conference district meet, which takes place Friday and Saturday. Scappoose coach David Richmond, whose crews moved up from the 4A Cowapa League this school year, hazards a guess as to who the other top contenders will be at Parkrose. "Just from what I have seen, the Wilsonville, St. Helens and Hillsboro girls all look pretty strong and should push each other. Parkrose and Hillsboro look like formidable challengers on the boys' side," Richmond said. 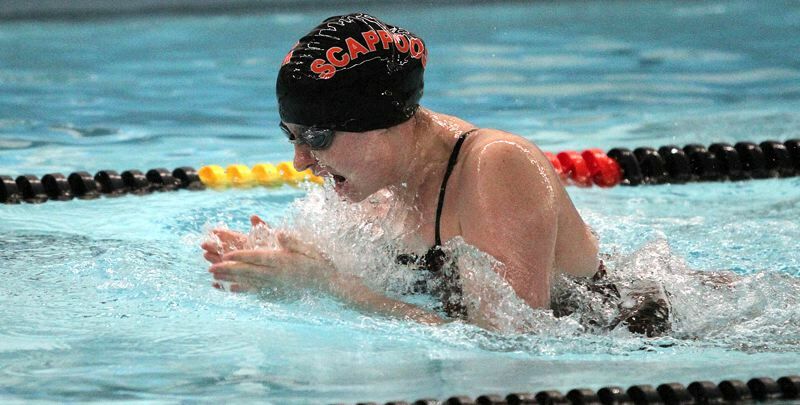 The Scappoose boys are coming off a strong showing in a tuneup meet last week — they went to Astoria and swam in the Cowapa championships as a nonscoring entrant. "Our goal is to always strive to compete hard and win any meet we participate in," Richmond said. "We're really excited for meet day to arrive and give it a run in this new district." Richmond tabulated how the Indians (and 3A Rainier) would have finished, if they were part of the Cowapa. The Scappoose boys would have won by a large margin, and the girls would have finished fourth, only one point out of third place. It would have been a third consecutive league title for the Scappoose boys — and by more than double the Indians' margin of victory last year (55 points). And the girls' solid performance came even with the absence of one of their top swimmers, Elizabeth McIsaac. "I was really pleased overall with the boys' win, but also with the effort level on both sides, as we have been dealing with nagging illness across the board," Richmond said. "We have had so many kids battling through sickness and struggling to get through practices. Despite that, we had many of the kids still swimming PRs or right at their PRs. Overall, most of his swimmers were not far off their best times, "so I like to think if we can get healthy we can see maximum effort and significant improvements in the last meet of the season." Highlights from the Cowapa championship include fastest times in eight of 11 events by the Scappoose boys — and it almost was nine, as Panachai Kongja, the team's senior exchange student from Thailand, was disqualified in the 100 butterfly for twitching in the starting blocks. "Better to have that happen now than at district," Richmond said. The individual "firsts" for Scappoose in the Cowapa meet: Quincy Reynolds in the 200-yard freestyle, Will Blair in the 50 and 100 freestyle; Cadmen Posvar in the 500 free, and Nash Wilson in the 100 backstroke. The Indians' relay teams all took first. In the 200 medley relay, Wilson, Kongja, Posvar and Sharp were one second faster than Cowapa champion Valley Catholic. In the 200 free relay, Blair, Reynolds, Posvar and Sharp teamed up to go nearly eight seconds faster than league winner Astoria. And, in the 400 free relay, Wilson, Reynolds, Kongja and Blair finished about 20 seconds ahead of Cowapa champ Valley Catholic. Another individual performance of note came from Brisyn Maller, who turned in a strong 100 backstroke time, finishing third in 1:12.16. "He always has come through in February with his times, and we saw that happen again," Richmond said. Austin Lopez was seventh in the 100 back with a PR of 1:26.17. "He continues to get stronger and stronger," Richmond said. The coach gave Owen Reynolds a try in the 500 freestyle, and he took sixth place. "We feel he gave us another weapon in the event for district," Richmond said. Owen Reynolds also had a significant time drop, to 1:18.42, for seventh in the Cowapa 100 breaststroke. For the Scappoose girls, Maddy Thorne came through with a personal best of 1:30.33 to take sixth in the 100 breaststroke. And Lyla Dubois had "her best meet of the year," Richmond said, as she sliced nine seconds off her previous best in the 200 freestyle and four seconds off her former PR in the 100 back.